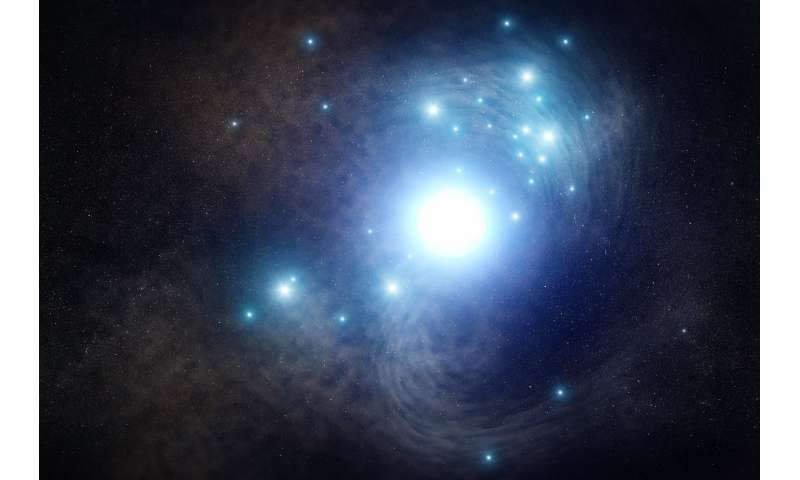 Located 65 million light-years away is a blue supergiant star that once existed inside a cluster of young stars in the spiral galaxy NGC 3938, as shown in this artist's concept. It exploded as a supernova in 2017 and Hubble Space Telescope archival photos were used to locate the doomed progenitor star, as it looked in 2007. The star may have been as massive as 50 suns and burned at a furious rate, making it hotter and bluer than our Sun. It was so hot, it lost its outer layers of hydrogen and helium. When it exploded, astronomers categorized it as a Type Ic supernova because of the lack of hydrogen and helium in the supernova's spectrum.